will You Want to Do?" There are so many sports Lake Garda provides the ultimate back drop for...it's a "Sporting Paradise"! If you're into sports, there's no shortage of them...Golf, Tennis, Mountain biking, Rock climbing or paragliding, these are just some of the many sports to do around the lake. What about Sports on the lake? Let's see...Windsurfing, Sailing, Water-skiing, Jet-skiing Snorkeling...have I missed any?! Let's take a look at them now. So...Are You Ready for Lake Garda Sports to be revealed? Torbole, at the north of Lake Garda is the windsurfing capital and has played host to many major championships. .... on some days there are literally hundreds of surfers. But the lake's so big there's plenty of room for everyone to enjoy themselves. The view's not bad either! You can't get much better then enjoying the lovely scenery while swinging a 9-iron! Golfing at Lake Garda is popular, and there are number of Golf courses around the lake, particularly on the west shore. Mountain biking at Lake Garda? Find out about the best trails around the Lake. Enjoy the wonderful scenery as you pedal. The Mountain biking page is located in the leisure section. There are a few local clubs and sports centres that offer things like tennis and squash. Tennis is very popular here and a number of hotels also have courts on the own grounds and some even tennis training camps. 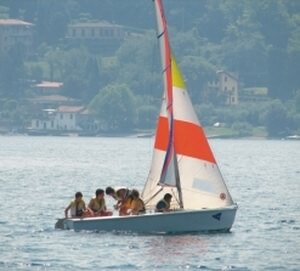 Sailing is a very popular sport and sailing schools can be found in lots of places around the Lake. After surfing this is this probably the next favourite type of water sports Lake Garda is famous for. Running or jogging is enjoyed by many people at Lake Garda. The north end of the lake is particularly popular for this. If you are a serious runner how about doing a Lake Garda Marathon? Diving in Lake Garda is wonderful ...the clear and calm waters make ideal conditions. It also also great for snorkelling for those of you who want to study underwater without going to lengths of a scuba dive. The North end of the Lake has some awesome cliffs for rock climbing. Experience the adreneline rush of the extreme sports Lake Garda has to offer! 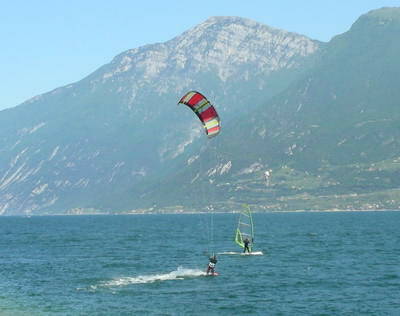 With the great winds and loads of space kite surfing is becoming more and more popular on Lake Garda. Maybe you'd rather fly off the cliffs then climb up them! Check out all about paragliding at Lake Garda. Believe it or not, snow does fall on the high ridges on Northern Lake Garda, so you can enjoy some skiing at Monte Baldo and other places in the Dolomites. These areas are covered in the Leisure & Family section of this website. What is the most extreme sport you have ever done at Lake Garda? 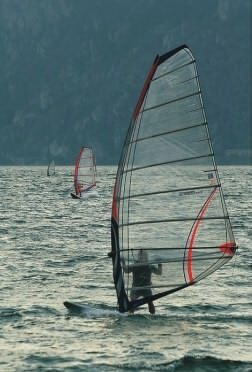 Have you taken part in an adrenalin pumping sport at Lake Garda? Why not share your story about it and you are highly likely to get your own spot on our website! Your story could well feature on a dedicated web page and may even get in our newsletter too! How good would it feel to show your friends and family your own Lake Garda story on a well respected Lake Garda site! We love pictures as well, so feel free to send us your best shots and there will be no mistaking you then!